Every copy of Marching Off the Map comes with a free Travel Guide. Leading 21st century students can feel like an adventure into unexplored lands. The natives of these uncharted territories, those born after the turn of the century, hold vastly different attitudes and behaviors toward learning and authority than prior generations. They communicate in rapidly evolving digital languages. They have very short attention spans (6-8 seconds). They multitask everything—and many even create and maintain multiple personas on social media. The “old maps” we used successfully in education, leadership, and parenting to help guide our students through adolescence are now obsolete. We desperately need new strategies on how to navigate this landscape. Inspire our students to “own” their education and their future. Lead our students from an attitude of apathy to one of passion through metacognition. Give our students the tools to handle the complexities of an ever-changing world. Raise children who make healthy progress, both emotionally and intellectually, through their teenage years. Innovate any educational environment to utilize student’s learning preferences. Leverage what is culturally in order to connect with our students, while instilling in them the wisdom and advice to succeed in any stage of life. The time has come to bravely accept the challenge of charting this Brand New World. This remarkable generation can accomplish great things, but we need to guide them. It’s up to us to boldly go Marching Off the Map . . . the future of our children depends on it. The following is included your order of Marching Off the Map. Marching Off the Map is the much-needed road map for the educators, parents, coaches, and youth leaders interested in guiding today’s students. 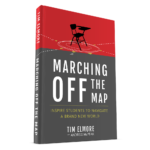 Tim Elmore understands today’s student and this book, Marching Off the Map, is a compass for those of us to lead them. It is a must read for anyone who cares about the future. Profound, insightful, and compelling! Tim Elmore’s best work! “Marching Off the Map” challenges us all to become champions for our young people. A brilliant tapestry of research, personal stories, and strategies for change necessary to impact generations to come. A must read! In this age of accelerating change, parents and teachers need just the kind of guidance that Tim Elmore provides in this primer of learning in the 21st century. As Tim puts it, ‘The Old Maps Don’t Work Anymore,’ so we better get used to the state of nonstop innovation as an abiding feature of our time if we wish to raise children with moral grounding and intellectual discernment. It’s hard for us 40+-year-olds to recognize that the childhoods of Generation Z are altogether different from our own childhoods, but Marching Off the Map makes the task easier–and leads to better relations between the Old and the Young in America. Dr. Tim Elmore has proven to be next gen whisperer by demonstrating his balanced approach to investing in our young adults. His honest assessment of today’s students is filled with hope that refreshes any parent, coach, educator, or leader in the marketplace. Marching Off the Map fully addresses the fact that, while principles never change, technology has ushered us into terrain no man has ever ventured and our reliance upon it must alter the way we educate and connect with the current student. Tim Elmore’s “ Marching off the Map” is an insightful and thought provoking book to help us ignite students to learn in a brand new world. It provides new practical solutions to “why we must change, what must change and how we must change”. I am a great admirer of Tim and Growing Leaders, who have been instrumental in leadership development in our athletic program for almost a decade. This is an important must read for all who lead young people. Now more than ever, we must find new and innovative ways to actively engage students in their educational and leadership development. Dr. Elmore continues to share his insight and passion for students with this timely resource. This book sets a strong contextual “why,” with a clearly defined “what,” followed by real-world action steps to truly impact the next generation of leaders. Marching Off the Map is a must read for anyone who genuinely cares about the current generation of students. Tim Elmore and Andrew McPeak have written a book that is insightful, challenging, and helpful. Let this book be your guide to understand, engage and inspire students from pre-teens to young adults. Marching Off the Map is a winner! This book is a must read for those who want to better understand how different generations approach life. It not only makes a compelling argument about why we need to change the way that we interact with the younger generations that is based on extensive research, but also offers actionable steps that we can take to bring about that change and challenge students to give their best effort. As an educator and researcher, I am always looking for better ways to challenge students to make a positive impact on themselves and others. As I read this book, I immediately found things that I could use to better understand and motivate the younger generation. As a career coach and writer, I witness everyday the far-reaching effects of parenting and education on how we grow, develop, and thrive in our lives. I also see how negative, limiting messages and experiences can hold young people back from reaching their highest potential. I’m a huge fan of Tim Elmore’s work, and his new book is a powerful guide full of vital information for teachers, parents and employers who are committed to doing their part to support young people to thrive in a new world. Marching off the Map reflects Tim’s latest efforts to help our leaders, parents, teachers, and coaches impact the next generation. Tim’s work has impacted so many homes, schools, athletic programs, and businesses working with young people because of his research-based content and more importantly his tremendous heart for developing future leaders. His passion for leveraging the strengths of future generations is contagious – and his books are must-have resources for anyone developing young people. Standardized learning in a customized world is simply not working, and Dr. Tim Elmore’s revolutionary new book, Marching Off the Map, is all about charting a new course! Grounded in provocative research and loaded with practical application, Tim captures the essence of why transformative change is vitally important in how we lead, teach, and parent this unique generation of learners. This must-read book creates awareness, reveals a sense of urgency, and inspires a unified call to action that has the potential to profoundly change our world. We are living in dramatic times. Almost 30% of the planet is connected and communicating with a tool created by those who are younger than us. We may feel lost about how to lead, but Tim Elmore’s experience and insights are a great place to start–not only in understanding this emerging generation, but to fearlessly meet them there. Marching of The Map offers tremendous insight into our changing world and how we must respond to it. As educators we must shift our approach to meet this next generation where they are, and they will certainly come to us significantly different then any generation. Tim Elmore and Andrew McPeak do an excellent job of bringing this issue to light. Once again, Dr. Elmore provides a must read for those committed to helping young people succeed. 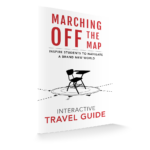 The insight and applicability highlighted in “Marching Off the Map” offers a practical framework for those interested in helping students prepare for college, career, and civic life. Tim Elmore and Andrew McPeak’s new book, “Marching off the Map”, is critically important and illuminates profound research to impact the lives of Gen Z, educators, parents, employers, mentors and communities. The imperative to forego the status quo and embrace and navigate change for students has never been more apparent. “Marching off the Map” should be required reading for all those invested in positive outcomes and solutions to ensure the success for every child, adolescent and young adult. Dr. Elmore has once again challenged us to think about our students and the way they learn. Marching Off the Map reminds us all to take risks and try new techniques to help inspire our next generation of leaders. Marching off the Map is a ‘call to arms’ for educators, as well as coaches, employers and parents. In this book, Elmore give educational leaders the background research and insight to make the case for restoring learning to our schools. Where many books highlight ‘all the problems with’ or ‘all the excitement of’ the emerging generation, Elmore once again gives us a balanced perspective for mentors and educators in our time. From teachers to superintendents, from principals to senators, leaders at all levels who will decide the climate in which students learn should read this book. As a leader and administrator in higher education, I’m always looking for ways to better inspire, connect and invest in the lives of others, especially our student-athletes. My friend, Dr. Tim Elmore, struck gold (again) with “Marching Off the Map.” This book provides us the “navigational beacons” for our journey to engage Generation Z and their experience as lifelong learners. You’ll gain a clear understanding of how this generation could shape the future and/or how the future could shape them. Dr. Elmore provides a forward-thinking and research based approach to challenge high level educators and coaches to change our mindset in order to stimulate learning in an ever changing culture. He offers practical ideas and insights to inspire a winning approach to helping youth and athletes succeed. Tim Elmore has been a guide for many coaches, faculty, staff, parents and students over the years. Marching Off the Map is an insightful addition to his guidance, as he enables us to peer into the future to see what students will need as they graduate. I recommend his work to anyone who cares about preparing our young for adulthood and leadership.